Internal Production Control according to EN 1090-1:2009+A1:2011 standard. 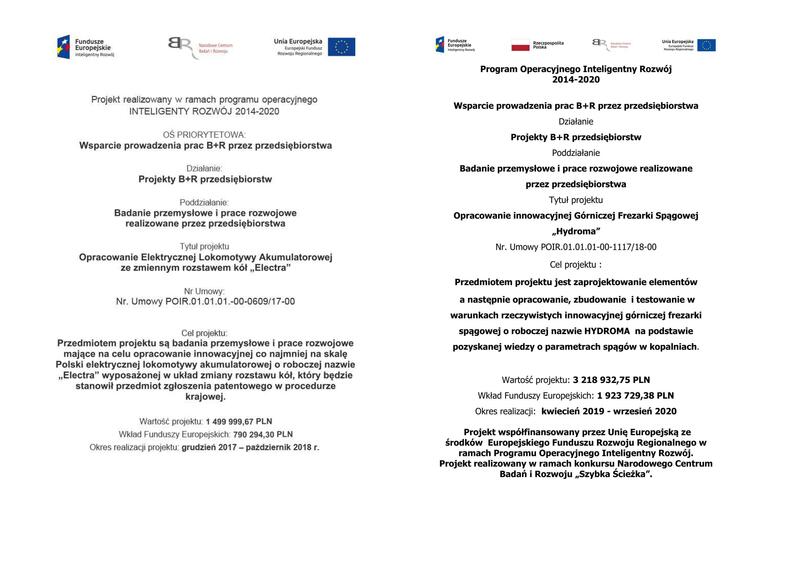 The certifying bodies with which we have cooperated in this scope are the Central Mining Institute in Katowice and the Polish Welding institute in Gliwice and TUV Rheinland. 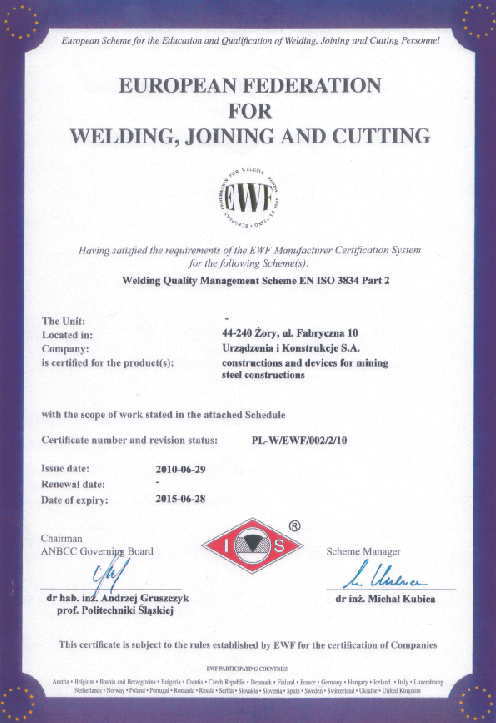 Among our products which are covered by the quality management system are devices used in explosion hazard zones, for which we have obtained the EC type testing certificates. The company has obtained the quality assurance notification for protection devices and systems used in explosion hazard zones issued by the Central Mining Institute. Types of devices which are covered by the above certificate are flame-proof alternators and Diesel engines with turbo-chargers. We gurantee that hazard minimization and safety related to the operating conditions of our products are a constant area of concern of the Company Management and its employees. 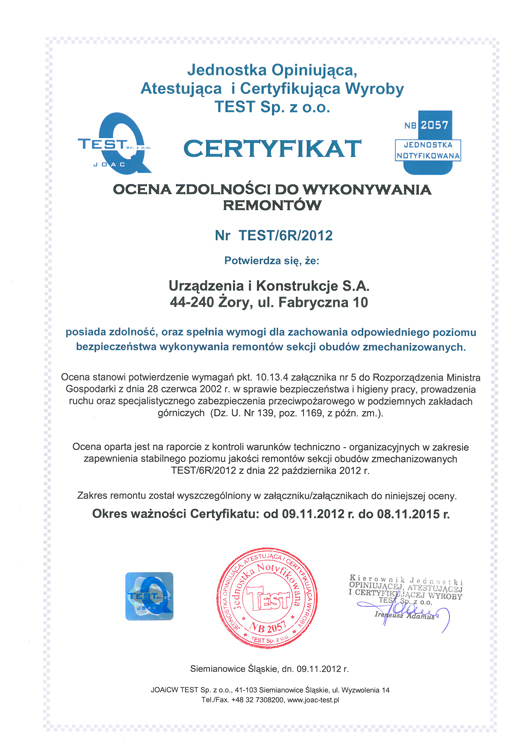 We guarantee that the requirements of our clients concerning a product used in an explosion hazard zone will be unequivocally set, and the implementation and delivery of the product will be possible only when the full conformity with the EC type testing certificate and other applicable requirements will be ensured. An important aspect of the Quality Management System in our company is the observance of the Quality Policy published by the Company Management Board, implemented e.g. by the production and delivery of products of quality that meets the requirements of our clients and always on time, performing internal audits and application of corrective measures in order to eliminate possible mistakes, precise determination of duties, competences and rights on all levels of management, first and foremost, provision of proper resources and organization, technical and economic resources and measures to implement the policy. Learn more about all achievements of our company in the remaining tabs on our webpage.